We aren’t even finished with March and yet one strong and selfless woman is already a contender for ‘Grandma of the Year’. 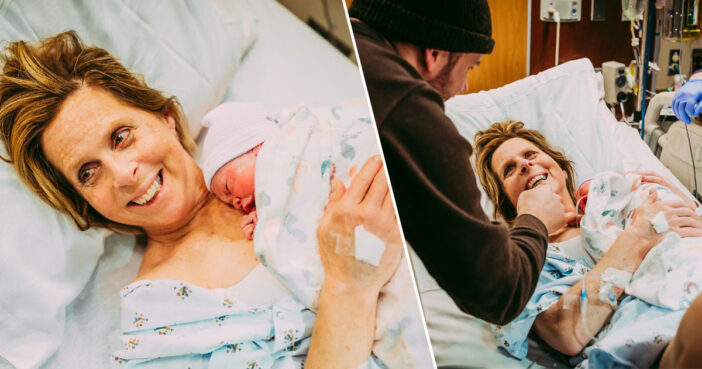 At 61 years old, Cecile Eledge, from Nebraska, had gone through the menopause a decade ago and hadn’t given birth for 30 years. 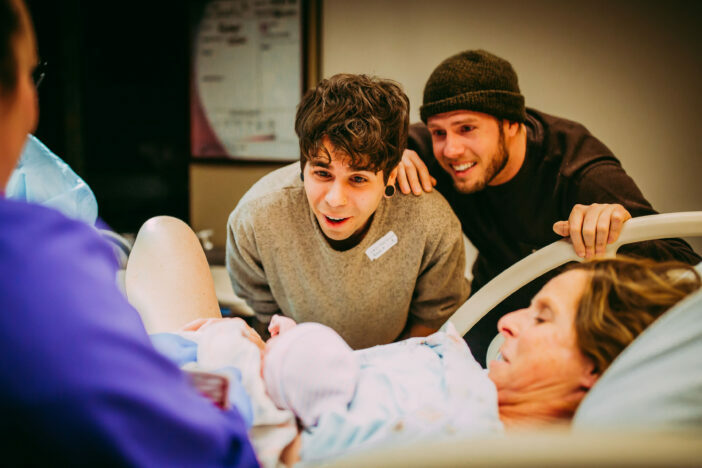 However, these significant obstacles didn’t stop her from offering to be a surrogate for her son Matthew Eledge, 32, and his husband, Elliot Dougherty, 29. Wanting to help her son start a family, Cecile told Matthew that she had ‘loved being pregnant’, and would ‘do it again in a heartbeat’ if she could. Initially skeptical, Matthew laughed off her kind suggestion when talking it through with Dr. Carolyn Maud Dougherty. However, Dr. Dougherty didn’t seem to think it was such an impossible idea. Cecile underwent a series of tests, which included a pap smear, blood and cholesterol tests, an ultrasound and a mammogram. Incredibly, she was found able to carry a child in her womb to full term. Matthew and Elliot were blessed with a second act of kindness when Elliot’s sister Lea Yribe, 26, offered to donate her eggs. Lea’s donated eggs were fertilized using Matthew’s sperm, before being implanted in Cecile’s uterus after she had undergone a series of hormone treatments. Cecile fell pregnant on the very first try. Cecile’s pregnancy was not without difficulties. On account of her age, she suffered terrible morning sickness as well as spikes in her blood pressure. However, she amazed doctors when she was able to give birth vaginally rather than through an expected C-section delivery. The baby was a little girl, named Uma. 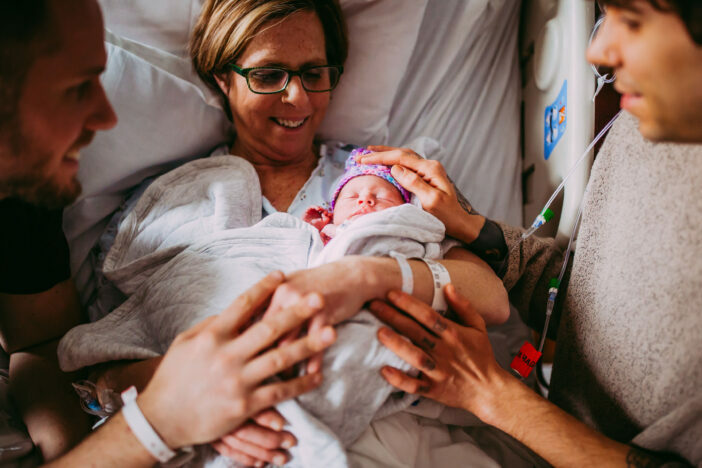 The first precious moments of baby Uma’s life were captured in stunning detail by photographer Ariel Panowicz, with the photos reflecting the sense of love and wonder which filled the delivery room. Cecile apparently didn’t find it difficult to hand Uma over to Matthew and Elliot, having been motivated throughout her extraordinary journey by the prospect of placing her ‘grandbaby’ in her son’s arms. Growing up we would always tease my mom. She’s very cute and sweet, so she let us get away with it. But in the midst of all the joking you can forget what someone is really like at the core of themselves. 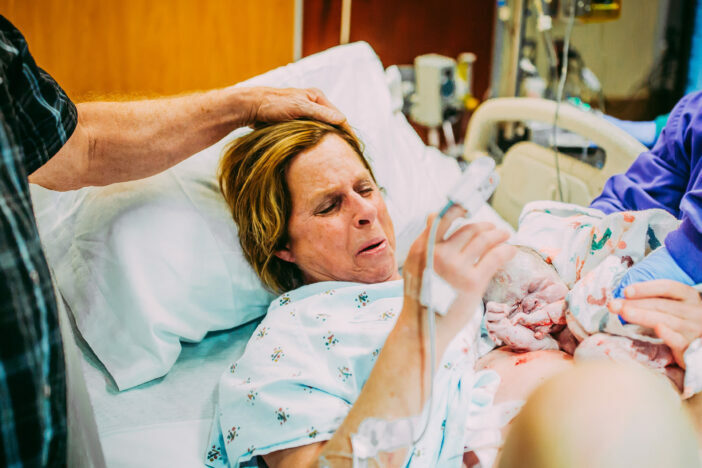 But being in that room [during the labor] was such a visceral moment. All the joking had stopped. She was like a warrior – so strong. I just have such a deep respect for her and the incredible woman she is. The whole experience behind it all has been so special. The acts of kindness that went into this all, and all of the support has been truly humbling. Uma will now have some incredible female role models to look up to in Lea and my mother. I can’t wait for her to develop an incredibly special bond with them both. Congratulations to Matthew and Elliot on the birth of their beautiful baby daughter. What a lucky little girl to be raised within such a strong and supportive family.